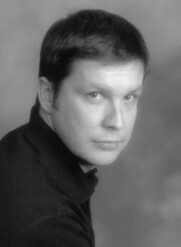 Simon Wood's Web Hideout » Blog » HUMP DAY: Butties!!! Chip butties to be exact. I’m sure there are quite a few of my English compatriots who’ll be groaning in shame now that I’ve let the cat out of the bag. 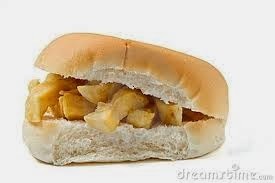 For those who don’t know what a chip butty is, let me explain. It is a masterpiece in comfort food. It’s essentially a French fry sandwich. Yes, a French fry sandwich. Fantastic or what!?! Hey, don’t give me that look, rest of the world. Every nation has its questionable culinary moments. America, you’ve served deep fried butter. Canada, you put cheese curds on French fries. Italy, you have that cheese with maggots in it. So get down off those high horses of yours before the French come along and eat them. A chip butty is one of those things you learn to love as a child because it’s so simple and innocent. It’s just some French fries slapped between a couple of pieces of buttered bread. The butter melts onto the chips giving them an extra dimension. The bread is soft against the crunch of the fries. It’s childhood on a plate. She tolerated my lifestyle but didn’t embrace it. I think that was the best I could have hoped for. Sometimes being different is a lonely road. 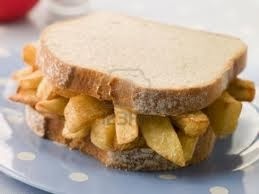 But I have not brought up the humble chip butty for confessional purposes only but as a business opportunity. Fast food and casual dining has stagnated. It’s all variations on the same theme. I think the world is ready for a new meal option—yes, the chip butty option. I’m thinking of offering a chip butty franchise. Naturally, it would be called BUTTIES!! Like a Subway, people would get to build their own butty. There’d be a choice of bread from white through to whole grain for the health conscious. There’d also be a choice of butters from plains, garlic, herb, what have you. There’d been a choice of French fries—steak cut, crinkle, shoestring, sweet potato, etc. You name it, I’d have you covered. Finally there’d be a choice of condiments if you want to spice things up beyond just butter. I’d have ketchup, brown sauce, BBQ sauce, gravy and curds (for the Canadians) just to name a few. Now doesn’t that all sound awesome. Don’t you want to invest in a franchise like that? I know I do and you will too. I will be announcing a Chipstarter campaign real soon so you can all get on at the ground floor. Now I know some of you will mock and scoff and that’s fine. But have you tried one? No. Maybe you should. It might just rock your world. CBs have the power.